Essential Oils & Aroma Ingredients. Japanese Peppermint Oil - 100% PURE Essential Oil! Essential Oil Name: Japanese Peppermint Oil Botanical Name: Mentha arvensis. Package/Form: 5ml, 10ml, 15ml, and 30ml bottles have euro droppers. Description: There are several species of the peppermint plant, many of which can grow to 3 feet in height, spreading due to their underground'runners. The mentha arvensis peppermint has hairy leaves with serrated edges, and purple spiked flowers. This Japanese Peppermint is known for its high menthol content, so high, in fact, that menthol crystals sometimes form right on the leaves. Common Uses: The familiar aroma of peppermint is known for both its warming and cooling properties. Friendly to the sinuses, peppermint is also useful to the muscular system, especially for women during monthly cycles or menopause. Peppermint is commonly used in tea, chewing gum, and candy, but the Essential Oil that we sell is much, much stronger and more concentrated, and should therefore be used in moderation. Peppermint is widely credited as being a digestive aid. The leaves contain menthol, which is a proven aid to digestion. A very fresh and clean smelling herb, it is a refreshing and energizing mental stimulant, can be used to enhance the well-being of digestive and respiratory system, and works as a good nerve tonic that helps with mental fatigue and nervous stress. And of course, it also helps relieve bad breath. 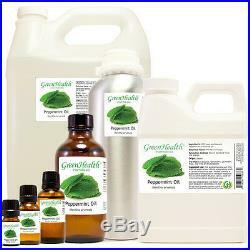 Additionally, peppermint can be used as a detterent against unwanted rodents and insects. Mixes well with: Basil, eucalyptus, geranium, grapefruit, juniper, lavender, lemon, myrrh, pine, rosemary, spearmint, tea tree, and wintergreen. Safety Information: Avoid if pregnant or breast feeding. Do not use on babies or small children. Do not use around pets, as it can be toxic in higher doses. May cause irritation to sensitive skin, however it is rare. Please do a patch test, first, before applying in large amounts. Do not use in baths. Should not be used in conjunction with homeopathic remedies, as it may act as an antidote. YOUR ESSENTIAL OILS COST LESS THAN OTHER BRANDS, HOW CAN YOU OFFER SUCH LOW PRICES? At WFMED we work directly with suppliers and distillers around the world, so that we can offer the best prices to our online retail customers. CAN I TAKE YOUR OILS INTERNALLY? Here at WFMED we do not recommend taking essential oils internally, as just because a product is natural does not mean it is safe to ingest. Please consult a doctor or aromatherapist before using essential oils. Orders placed on the weekend will be processed on the following Monday, or the following Tuesday if Monday is a holiday. ARE YOUR ESSENTIAL OILS WATERED DOWN OR DILUTED IN ANY WAY? Our essential oils are 100% pure and natural, and are never diluted or watered down in any way. We do offer a variety of blends and dilutions, some of which are combined with carrier oils such as jojoba or grape seed, but these blends are manufactured specifically as blends and are clearly labeled as such to avoid any confusion. DO ESSENTIAL OILS HAVE A GRADING SYSTEM TO TELL ME WHICH IS BETTER? There is no official system that classifies essential oils as grade A, B, C or even Therapeutic grade. Should you see a company or retailer advertise their product as being a certain grade, please be aware that this grade only applies to their own products, and does not apply to any other company's products. All GreenHealth essential oils are accurately labeled, and are the highest purity and quality available. With the exception of our fragrance oils, and nature-identical oils, which are clearly labeled as synthetic, all GreenHealth essential oils are 100% all pure and all natural. WHAT IS THE SHELF LIFE FOR YOUR OILS? The shelf life of our products can vary from species to species, and is also affected by storage conditions, but is generally 2-3 years from the date of distillation. WHAT IF I HAVE ALLERGIES? Our products are 100% natural, and are highly concentrated, so allergic reactions are possible in those with sensitivities to specific plants ex. If you have a tree nut allergy, please refrain from using tree nut based oils. Please be aware that, since essential oils are highly concentrated, you may experience an allergic reaction to an oil even if you've never experienced an allergic reaction to the same plant as it occurs in nature. If you're not sure if an oil will cause an allergic reaction, please dilute the oil and do a patch test, leaving it on the skin 30 minutes. If a reaction occurs, please stop using the product immediately. IS IT A WATERED DOWN ESSENTIAL OIL? A hydrosol, also known as a plant water or floral water, is the liquid byproduct of steam distilling an essential oil (essentially, condensation). A hydrosol is not a watered down essential oil. Hydrosols have many of the same therapeutic benefits as essential oils, but are less concentrated and therefore much gentler, and have a softer aroma than their essential oil counterparts. Any product you return must be in the same condition you received it and in the original packaging. Product Information Essential Oil Name: Japanese Peppermint Oil Botanical Name: Mentha arvensis Plant Part: Leaf Extraction Method: Steam Distilled Origin: Japan/China Package/Form: 5ml, 10ml, 15ml, and 30ml bottles have euro droppers. The item "GreenHealth Peppermint Essential Oil All Natural 5ml 1GAL Same Day Shipping" is in sale since Wednesday, April 29, 2015. This item is in the category "Health & Beauty\Natural & Alternative Remedies\Aromatherapy". The seller is "wf-medical" and is located in Burke, Virginia. This item can be shipped to United States, Canada, United Kingdom, Denmark, Romania, Slovakia, Bulgaria, Czech republic, Finland, Hungary, Latvia, Lithuania, Malta, Estonia, Australia, Greece, Portugal, Cyprus, Slovenia, Japan, China, Sweden, South Korea, Indonesia, Taiwan, Thailand, Belgium, France, Ireland, Netherlands, Poland, Spain, Italy, Germany, Austria, Bahamas, Philippines, Norway, Ukraine, Croatia, Malaysia, Colombia, Viet nam, Uruguay.